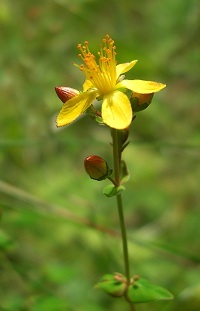 Slender St John's Wort can be identified easily because it is hairless with reddish stems. The yellow flowers are about 1 cm diameter with five petals and, looking closely, it is possible to see tiny black dots on the edges of the petals. The leaves are blunt oval. This flower can be found on roadsides, dry woodland and scrubland.